Each of us is motivated by needs. Our most basic needs are inborn, having evolved over tens of thousands of years. Abraham Maslow's Hierarchy of Needs helps to explain how these needs motivate us all. Maslow's Hierarchy of Needs states that we must satisfy each need in turn, starting with the first, which deals with the most obvious needs for survival itself. Only when the lower order needs of physical and emotional well-being are satisfied are we concerned with the higher order needs of influence and personal development. 1.2. Which model is most valid? Abraham Maslow developed the Hierarchy of Needs model in 1940-50s USA, and the Hierarchy of Needs theory remains valid today for understanding human motivation, management training, and personal development. Indeed, Maslow's ideas surrounding the Hierarchy of Needs, concerning the responsibility of employers to provide a workplace environment that encourages and enables employees to fulfil their own unique potential (self-actualization), are today more relevant than ever. Abraham Maslow's book Motivation and Personality, published in 1954 (second edition 1970) introduced the Hierarchy of Needs, and Maslow extended his ideas in other work, notably his later book Toward A Psychology Of Being, a significant and relevant commentary, which has been revised in recent times by Richard Lowry, who is in his own right a leading academic in the field of motivational psychology. Abraham Maslow was born in New York in 1908 and died in 1970, although various publications appear in Maslow's name in later years. Maslow's PhD in psychology in 1934 at the University of Wisconsin formed the basis of his motivational research, initially studying rhesus monkeys. Maslow later moved to New York's Brooklyn College. The Maslow's Hierarchy of Needs five-stage model below (structure and terminology - not the precise pyramid diagram itself) is clearly and directly attributable to Maslow; later versions of the theory with added motivational stages are not so clearly attributable to Maslow. 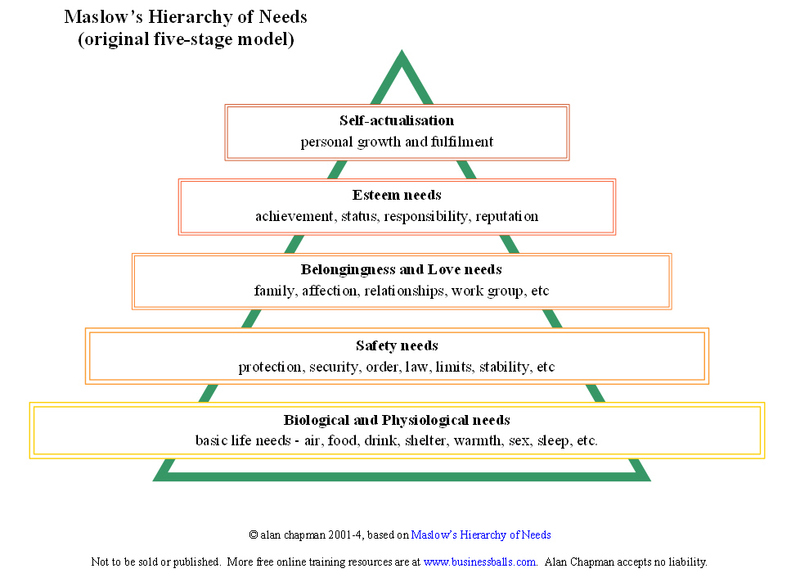 These extended models have instead been inferred by others from Maslow's work. Specifically Maslow refers to the needs Cognitive, Aesthetic and Transcendence (subsequently shown as distinct needs levels in some interpretations of his theory) as additional aspects of motivation, but not as distinct levels in the Hierarchy of Needs. Where Maslow's Hierarchy of Needs is shown with more than five levels these models have been extended through interpretation of Maslow's work by other people. These augmented models and diagrams are shown as the adapted seven and eight-stage Hierarchy of Needs pyramid diagrams and models below. There have been very many interpretations of Maslow's Hierarchy of Needs in the form of pyramid diagrams. The diagrams on this page are my own interpretations and are not offered as Maslow's original work. Interestingly in Maslow's book Motivation and Personality, which first introduced the Hierarchy of Needs, there is not a pyramid to be seen. See also the free Maslow's Hierarchy of Needs Quiz, which can be used to test/reinforce the learning offered in this article. Maslow's Hierarchy of Needs states that we must satisfy each need in turn, starting with the first, which deals with the most obvious needs for survival itself. Maslow's original Hierarchy of Needs model was developed between 1943-1954, and first widely published in Motivation and Personality in 1954. At this time the Hierarchy of Needs model comprised five needs. This original version remains for most people the definitive Hierarchy of Needs. This is the definitive and original Maslow's Hierarchy of Needs. Here is a quick simple self-test based on the original Maslow's 5-level Hierarchy of Needs. It's not a scientific or validated instrument - merely a quick indicator, which can be used for self-awareness, discussion, etc. N.B. Although Maslow referred to additional aspects of motivation, 'Cognitive' and 'Aesthetic', he did not include them as levels or stages within his own expression of the Hierarchy of Needs. N.B. Although Maslow referred to additional aspects of motivation, 'Cognitive', 'Aesthetic', and 'Transcendence', he did not include any of these as additional stages in the Hierarchy of Needs. Here is a quick self-test based on the extended 8-level Hierarchy of Needs. Like the 5-level Hierarchy of Needs self-test it is not a scientific or validated instrument - merely a quick indicator for helping self-awareness, discussion, etc. Which model is most valid? Abraham Maslow created the original five level Hierarchy of Needs model, and for many this remains entirely adequate for its purpose. The seven and eight level 'hierarchy of needs' models are later adaptations by others, based on Maslow's work. Arguably, the original five-level model includes the later additional sixth, seventh and eighth ('Cognitive', 'Aesthetic', and 'Transcendence') levels within the original 'Self-Actualization' level 5, since each one of the 'new' motivators concerns an area of self-development and self-fulfilment that is rooted in self-actualization 'growth', and is distinctly different to any of the previous 1-4 level 'deficiency' motivators. For many people, self-actualizing commonly involves each and every one of the newly added drivers. As such, the original five-level Hierarchy of Needs model remains a definitive classical representation of human motivation; and the later adaptations perhaps serve best to illustrate aspects of self-actualization. You can't motivate someone to achieve their sales target (level 4) when they're having problems with their marriage (level 3). You can't expect someone to work as a team member (level 3) when they're having their house re-possessed (level 2). See the Maslow interviews DVDs - especially Maslow and Self-Actualization to understand the subject more fully. These films were made in 1968 and are helpful on several levels, and both wonderful teaching and learning aids. These materials also help to illustrate the far-reaching and visionary nature of Maslow's thinking, several decades ago. The above materials are published by Maurice Bassett on behalf of the estate of Abraham Maslow. Businessballs takes no commission and recommends them simply because they are wonderful materials for all students and followers of Maslow's very special work. Biological and Physiological needs - wife/child-abuse help-lines, social security benefits, Samaritans, roadside recovery. Safety needs - home security products (alarms, etc), house an contents insurance, life assurance, schools. Belongingness and Love needs - dating and match-making services, chat-lines, clubs and membership societies, Macdonalds, 'family' themes like the old style Oxo stock cube ads. Esteem needs - cosmetics, fast cars, home improvements, furniture, fashion clothes, drinks, lifestyle products and services. Self-Actualization needs - Open University, and that's about it; little else in mainstream media because only 2% of population are self-actualizers, so they don't constitute a very big part of the mainstream market. Maslow's Hierarchy of Needs is an excellent model for understanding human motivation, but it is a broad concept. If you are puzzled as to how to relate given behaviour to the Hierarchy it could be that your definition of the behaviour needs refining. For example, 'where does 'doing things for fun' fit into the model? The answer is that it can't until you define 'doing things for fun' more accurately. You'd need to define more precisely each given situation where a person is 'doing things for fun' in order to analyse motivation according to Maslow's Hierarchy, since the 'fun' activity motive can potentially be part any of the five original Maslow needs. Biological - health, fitness, energising mind and body, etc. Self-Actualization drivers - challenge, new experiences, love of art, nature, etc. However in order to relate a particular 'doing it for fun' behaviour the Hierarchy of Needs we need to consider what makes it 'fun' (i.e., rewarding) for the person. If a behaviour is 'for fun', then consider what makes it 'fun' for the person - is the 'fun' rooted in 'belongingness', or is it from 'recognition', i.e., 'esteem'. Or is the fun at a deeper level, from the sense of self-fulfilment, i.e., 'self-actualization'. Apply this approach to any behaviour that doesn't immediately fit the model, and it will help you to see where it does fit. Maslow's Hierarchy of Needs will be a blunt instrument if used as such. The way you use the Hierarchy of Needs determines the subtlety and sophistication of the model. For example: the common broad-brush interpretation of Maslow's famous theory suggests that that once a need is satisfied the person moves onto the next, and to an extent this is entirely correct. However an overly rigid application of this interpretation will produce a rigid analysis, and people and motivation are more complex. So while it is broadly true that people move up (or down) the hierarchy, depending what's happening to them in their lives, it is also true that most people's motivational 'set' at any time comprises elements of all of the motivational drivers. For example, self-actualizers (level 5 - original model) are mainly focused on self-actualizing but are still motivated to eat (level 1) and socialise (level 3). Similarly, homeless folk whose main focus is feeding themselves (level 1) and finding shelter for the night (level 2) can also be, albeit to a lesser extent, still concerned with social relationships (level 3), how their friends perceive them (level 4), and even the meaning of life (level 5 - original model). Like any simple model, Maslow's theory not a fully responsive system - it's a guide which requires some interpretation and thought, given which, it remains extremely useful and applicable for understanding, explaining and handling many human behaviour situations. There are certainly some behaviours that are quite tricky to relate to Maslow's Hierarchy of Needs. Normally, we would consider that selflessly helping others, as a form of personal growth motivation, would be found as part of self-actualisation, or perhaps even 'transcendence' (if you subscribe to the extended hierarchy). The principle has also been applied quite recently to developing disaffected school-children, whom, as part of their own development, have been encouraged and enabled to 'teach' other younger children (which can arguably be interpreted as their acting at a self-actualising level - selflessly helping others). The disaffected children, theoretically striving to belong and be accepted (level 3 - belongingness) were actually remarkably good at helping other children, despite their own negative feelings and issues. Under certain circumstances, a person striving to satisfy their needs at level 3 - belongingness, seems able to self-actualise - level 5 (and perhaps beyond, into 'transcendence') by selflessly helping others, and at the same time begins to satisfy their own needs for belongingness and self-esteem. Such examples demonstrate the need for careful interpretation and application of the Maslow model. The Hierarchy of Needs is not a catch-all, but it does remain a wonderfully useful framework for analysing and trying to understand the subtleties - as well as the broader aspects - of human behaviour and growth. Maslow's work and ideas extend far beyond the Hierarchy of Needs. Maslow's concept of self-actualisation relates directly to the present day challenges and opportunities for employers and organisations - to provide real meaning, purpose and true personal development for their employees. For life - not just for work. Increasingly, the successful organisations and employers will be those who genuinely care about, understand, encourage and enable their people's personal growth towards self-actualisation - way beyond traditional work-related training and development, and of course way beyond old-style X-Theory management autocracy, which still forms the basis of much organised employment today. In fact, virtually all personal growth, whether in a hobby, a special talent or interest, or a new experience, produces new skills, attributes, behaviours and wisdom that is directly transferable to any sort of job role. Both filmed in 1968, after Maslow's heart attack, and obviously prior to his death in 1970, these superb Maslow DVDs show Dr Maslow being interviewed, respectively by Dr Everett Shostrom, and also interestingly, Warren Bennis. Both films - available here - were made in 1968 and were remastered in black and white in 2007. The remarkable content, and the 1960s styling and production add to the seductive and powerful effect of these films, which stems chiefly from Maslow's brilliant thinking and natural charismatic presence. Being Abraham Maslow is half an hour long, and features Maslow talking to Warren Bennis about his life, his views of the world and his work. It is utterly compelling and shows Maslow's staggering perception of the issues which challenge society and humankind today - and this was recorded in 1968. The film, basically irresistible throughout, includes some marvelous moments, such as Maslow's questioning observation as to "...how good a human nature does society permit?... ", and the visionary statement that: "...The Good Society now has to be one world - it has to be one world or it won't work - nationalism is dead - it just doesn't know it yet..."
He said this in 1968 and still today our leaders don't see it. Maslow and Self-Actualization is an hour long, in two parts, in which Maslow is interviewed by Dr Everett Shostrom about Self-Actualization, in which Shostrom uses references and quotes extracts from Maslow's book Motivation and Personality, and Maslow explains and develops the themes. The structure is excellent - ideal for teaching and training. Self-Actualization is presented by Maslow through a series of answers, working through the concept in four sections: honesty, awareness, freedom and trust. Maslow brings these headings to life, conveying some very complex intangible ideas - such as objectivity, detachment, maturity, love, acceptance, modesty and grace - in the most understandable way. Personally this video is one of the most powerful things I've ever seen. The film can be used as a teaching aid, and/or as the presenter suggests, to help people understand Self-Actualization as goals or values to aspire to: "...ideas for living and being, fully functioning to one's full capacity..."
For anyone teaching or studying motivation, psychology, Maslow, and related areas - or simply interested in living a fulfilled and good life - these films will be fascinating, and for some people deeply inspirational too. Both films are available here. In terms of format/compatibility, these US-made films wouldn't play on my (cheap) UK DVD player, but they ran happily on my (cheap) UK PC. When you read Maslow's work, and particularly when you hear him speak about it, the relevance of his thinking to our modern world of work and management is astounding. Maslow's explanations and interpretations of the human condition remain fundamentally helpful in understanding and addressing all sorts of social and behavioural questions - forty or fifty years after his death. Maslow is obviously most famous for his Hierarchy of Needs theory, rightly so, because it is a wonderfully simple and elegant model for understanding so many aspects of human motivation, especially in the workplace. The simplicity of the model however tends to limit appreciation of Maslow's vision and humanity, which still today are remarkably penetrating and sensitive.